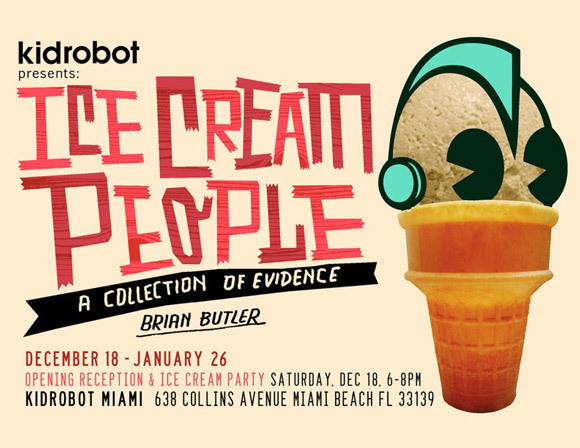 Kidrobot Miami is proud to present the Ice Cream People-A Collection of Evidence by Brian Butler. Stop by Kidrobot Miami and illustrate your own Ice Cream Person. Drawings collected through out the show will act as evidence toward your frozen experience. Ice Cream People works on display include Shepard Fairey, MCA Evil Design, Heidi Kenney and many more. The opening reception/ice cream party will kick off on Saturday, December 18 from 6-8 pm in Kidrobot Miami’s gallery at 638 Collins, Miami Beach. The Ice Cream People exhibition will be on display through January 26. Ice Cream People loose in Miami! Ice Cream People at Kidrobot recap!